Wednesday, May 2, 2018, 11:30 a.m.
Maxfield’s conversations with writers have been favorably compared to Terry Gross’ Fresh Air, City Arts & Lectures, and Celebrity Forum. Her friendly yet probing style encourages writers to reveal their writing and thought processes, delves into the world of agents and publishers, and examines interesting angles of their most recent publication. Maxfield has a BA (economics), an MBA (marketing) and an MFA (writing). She worked for Silicon Valley’s ComQuest, ROLM Corporation, Polycom, Apple, and 3Com. Her non-fiction book, Starting Up Silicon Valley, was named a Kirkus Best Book of 2014 and was a 2015 Eric Hoffer winner in the business category. Her award-winning short fiction and personal perspectives have appeared in the San Francisco Chronicle, Ontario Review, and numerous other literary journals. Don't miss this revealing conversation with author/journalist Joyce Maynard about her remarkable life and newest, moving memoir: The Best of Us. A delicious lunch paired with wine is included in your ticket purchase. Books will be available for sale. In 2011, when she was in her late fifties, Joyce Maynard fell in love: Jim wore a rakish hat over a good head of hair; he asked real questions and gave real answers; he loved to see Joyce shine in and out of the spotlight; and he didn't mind the mess she made in the kitchen. He was not the husband Joyce imagined, but he quickly became the partner she had always dreamed of. Then, just after their one-year wedding anniversary, her new husband was diagnosed with pancreatic cancer. During the nineteen months that followed, as they battled his illness together, she discovered for the first time what it really meant to be a couple. This is their story. Charting the course through their whirlwind romance, a marriage cut short by tragedy, and Joyce's return to singleness on new terms, The Best of Us is a life-affirming reflection on coming to understand true love through the experience of great loss. 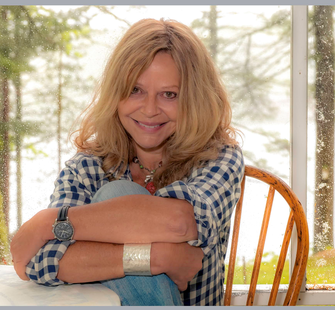 Joyce Maynard is the author of sixteen books including the novels To Die For and Labor Day (both adapted for film) and the bestselling memoir At Home in the World, translated into seventeen languages. Her essays and have appeared in dozens of publications and numerous collections. She has been a frequent performer with The Moth, a fellow of the MacDowell Colony and Yaddo, and founder of the Lake Atitlan Writers’ Workshop. She makes her home in Lafayette, California. NOTE: Advance ticket purchase required; we cannot accept walk-ups to this event.